Robert Elwall tackles the enigma of Edwin Smith (1912-1971) through a careful combination of photographs and text in the well-produced Evocations of Place. Around 120 plates and 20 figures illustrate the broad range of his work, from documentary studies in the mid-1930s through his great architectural oeuvre to landscapes at the end of the 1960s. Three chapters explore his discovery of respectively: Photography, Britain, and Abroad. Taken together they track his tough early life; his training as an architect and draughtsman; his discovery of photography and the development of his eye for detail and the unconsidered; writing guides for the Focal Press; meeting with Olive Cook and their joint publications on English architecture; working abroad, especially in Italy; and later engagement with conservation issues and a love of landscape. A subtext to the photography is Smith’s passion for painting and drawing, which Elwall gently says ‘failed to find an audience’. Evocations of Place notes the self-proclaimed conventional wisdom about Smith that he was a photographer only out of necessity. Elwall then goes on to show through an assessment of Smith’s life – and crucially through the pictures themselves – that he was passionate about photography, innovative in his visual perceptions, technically extremely accomplished and dedicated to the effective presentation of his work as a way of communicating his view of the world. Smith the reluctant photographer becomes Smith the passionate photographer. This reflects one of the great strengths of the book: Elwall gives us an impartial, if favourable, view of the work. For too long Smith and his photography had only been seen and promoted through the loving eyes of his utterly devoted widow, Olive Cook. A more detached view has been long overdue. 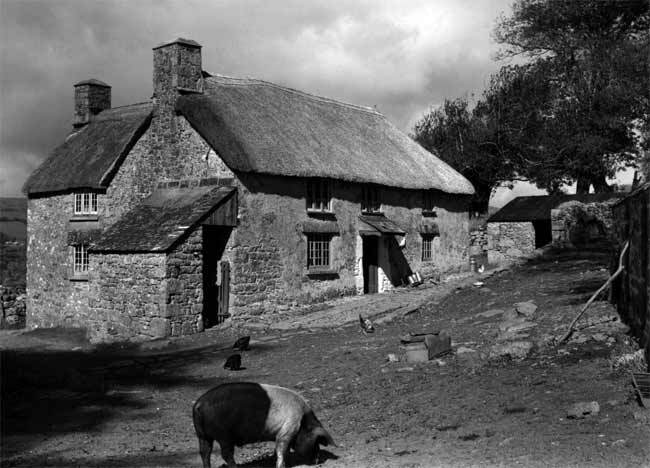 Edwin Smith had a marvellously perceptive eye that saw the extraordinary in the everyday, the telling detail in the bigger picture and the sublime in the broader view. But the early work is very variable, what Elwall calls ‘heterogeneous’, though he might have said derivative; and the later work looses it edge and increasingly seemed ‘removed from the reality of contemporary existence’. This does not detract from the quality of his best work, but rather serves to emphasise it through contrast. As Elwall says, the pictures represent ‘a unique insight into the cultural and social milieu of mid-twentieth-century Britain’. In particular they celebrate the value of local distinctiveness and sense of place as expressed in the architecture, materials and landscape. When Smith died this view was becoming increasingly unfashionable, but now in a rapidly changing world identity and belonging are seen as increasingly vital to community harmony and quality of life. This is not to hark back to Smith’s golden days of the 1950s as somehow the embodiment of national consciousness, but rather to seek within each age its valued and enduring qualities. A strength of Elwall’s new, independent stance is that he avoids a purely romantic perspective by setting Smith’s photography in its social, artistic and architectural context. The visually idealised documentary work on the North East made during the 1930s takes on a quite different tone when viewed with the knowledge that he was working with Sir Arnold Talbot Wilson, a maverick MP, who ‘combined a libertarian zeal for social reform at home with enthusiastic support for Fascist regimes abroad’. Farmhouses, churches and great houses in the 1950s are set within the environment of modernism and the Festival of Britain. At the end of the 1960s, when his unpopulated, almost prelapsarian view of England had to compete for attention with the harder edged, more critical, view of the Tony Ray-Jones generation, Smith became isolated from the modern world. Olive Cook never sought to open the window on these influences and tensions. Elwall cites Atget as a major influence on Smith (Cook was inclined to stress that Smith’s genius was entirely his own) and the case for that is convincing. However, his appellation of Smith as ‘the English Atget’ is an interesting one and fertile ground for future debate. It might be argued that Atget dealt with the actual, what was there and not the dream, while Smith tried to turn the actual into his dream of an England that was slipping away even as he worked. Atget captured his world in simple, almost forensic images and with the perspective of history we overlay them with a patina of romance; Smith sought to capture the romance, the illusion and we have to try to re-imagine the real world. Yes, fertile ground for debate. 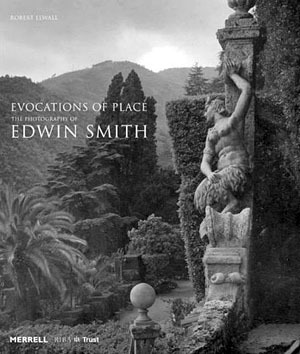 Evocations of Place will hopefully bring the work of Edwin Smith to a new generation, not just of photographers, but to everyone who cares about architecture, the environment and the apparent bland homogenisation of the world around us. As Elwall concludes, Smith’s work teaches us to see; and maybe in doing so value more where we live, value it not only for tradition, but also for true worth in the new, which Smith found so challenging. ‘Evocations of Place‘ is written by Robert Elwall and published by Merrell Publishers Ltd., in association with the RIBA Trust.